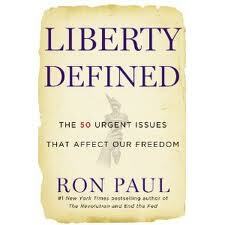 Ron Paul has a new book "Liberty Defined" coming out in about a week. Rights belong to individuals, not groups; they derive from our nature and can neither be granted nor taken away by government. All peaceful, voluntary economic and social associations are permitted; consent is the basis of the social and economic order. Justly acquired property is privately owned by individuals and voluntary groups, and this ownership cannot be arbitrarily voided by governments. Government may not redistribute private wealth or grant special privileges to any individual or group. 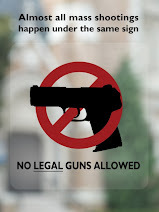 Individuals are responsible for their own actions; government cannot and should not protect us from ourselves. Government may not claim the monopoly over a people's money and governments must never engage in official counterfeiting, even in the name of macroeconomic stability. Aggressive wars, even when called preventative, and even when they pertain only to trade relations, are forbidden. Jury nullification, that is, the right of jurors to judge the law as well as the facts, is a right of the people and the courtroom norm. All forms of involuntary servitude are prohibited, not only slavery but also conscription, forced association, and forced welfare distribution. Government must obey the law that it expects other people to obey and thereby must never use force to mold behavior, manipulate social outcomes, manage the economy, or tell other countries how to behave. Just got busted by one of Itasca's city cops doing 7 miles over the speed limit on I-35W last night while coming home to Arlington from Austin. We were 5 vehicles doing the same speed and all in the right lane, not the passing lane. I was the only dark vehicle and he picked me out of this line of SUV's going north. I was the third vehicle and another was behind me. He lasered me, he wrote on the ticket, 980 yards away; he was hiding behind concrete pilings holding an overpass. Anyone other there know how these lasers work and does it do any good to fight this and appeal to county court?